Woking is about to get a new pub – The Ogilvy. Well at least it’s a refurbished and re-branded one. RSVP in Chertsey Road, Woking shut down recently and is being reworked as a traditional free house (according to the pub fascia). Now I never went in RSVP in all the years I’ve been living in Woking – I was outside their demographic as I think the marketing people say. But I’m always interested in a new pub when you hear about so many that are closing down. 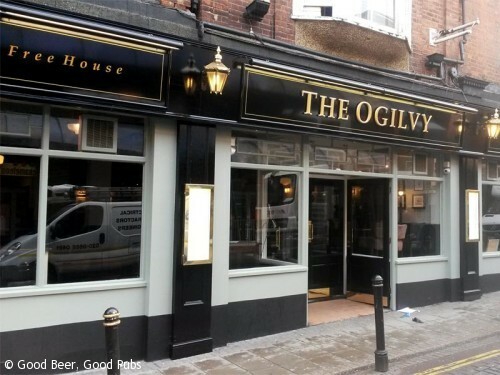 Whilst walking past The Ogilvy this morning it is obvious that work is coming to a climax. The bar is in place as is a lot of the seating. There are pictures on the wall and everything smells of drying paint. I was pleased to see four hand pumps on the bar and was curious to know what would be on. The pub is owned by Stonegate Pubs who operate a number of other pubs in Surrey including the Greyhound in Ash and another RSVP in Camberley. Some of them carry real ale I believe. Wells Bombardier and GK Old Speckled Hen are also in the cellar ready for when the first ones run out. Mark used to work for the St Austell brewery and is keen to see an interesting real ale selection. He is also determined that the quality will be good and will be going for Cask Marque accreditation soon. Mark wants to feature more local beers and is open to ideas so if you do visit the pub you can make a suggestion – also through the pub’s website when it is operational. Facebook page and Twitter are being set up shortly. 12pm – 11pm on Sunday. Food is going to be available but I haven’t seen a menu yet. The pub is going to allow children in each day until 7pm. The accessibility features are good with level access, wide doors and a dedicated disabled toilet.